2دانشجوی کارشناسی ارشد مشاوره،دانشگاه آزاد واحد علوم و تحقیقات اهواز، اهواز، ایران. 3استاد گروه مشاوره.گروه مشاوره، دانشگاه شهید چمران اهواز، اهواز، ایران. زمینه: عوامل روانشناختی، نقش مهمی در سبب شناسی بیماری ایدز و درمان آن ایفا می‌کنند. بکارگیری مداخله‌های شناختی رفتاری موجب کاهش افسردگی و متقابلأ افزایش کیفیت زندگی بیماران مبتلا خواهد شد. هدف: هدف پژوهش حاضر بررسی اثر بخشی آموزش ذهن آگاهی مبتنی بر کاهش استرس بر افسردگی و کیفیت زندگی بیماران مبتلا به ایدز و HIV بوده است. مواد و روش‌ها: طرح پژوهش حاضر از نوع نیمه آزمایشی با پیش آزمون، پس آزمون و گروه کنترل بوده است. از میان بیماران مبتلا به ایدز و اچ.آی.وی که به مرکز مشاوره و روان درمانی خرمشهر مراجعه کرده اند، بر اساس سن، وضعیت اجتماعی، اقتصادی، عدم ابتلا به بیماری هایی جسمانی دیگر، کسب یک انحراف معیار بالاتر از میانگین در پرسشنامه افسردگی بک (BDI) و یک انحراف معیار پایین تر از میانگین در پرسشنامه کیفیت زندگی و سایر متغیرهای مورد نظر در پژوهش کاملاً همگون بودند. سپس بر اساس ملاکهای ورود و خروج تعداد 40 نفر انتخاب و به شیوه تصادفی به دو گروه آزمایش و کنترل تقسیم شدند. گروه آزمایش طی 8 جلسه آموزش ذهن آگاهی مبتنی بر کاهش استرس را دریافت کردند، گروه کنترل هیچگونه مداخله‌ای دریافت نکردند. ابزار مورد استفاده در پژوهش شامل پرسشنامه افسردگی بک نسخه دوم (BDI) و پرسشنامه کیفیت زندگی (IRQOLI) بوده است. داده های پژوهش با استفاده از تحلیل کوواریانس چند متغییری(MANCOVA) ، مورد تجزیه و تحلیل قرار گرفت. 1-CaneT P C. "Facilitating and supporting HIV+ parenthood: Lessons for developing the advocate role of voluntary HIV support services workers." Sexual & Reproductive Healthcare,2018,16: 186-191. 2-Zarabadypoor M, Borhanmajaby K, Bagherzade S, Mozafary F. A surveyon the knowledge and attitude of patients referring to the Qazvin dental faculty about AIDS, Journal of Qazvin University of Medical Sciences. 2018, 22 (1), 96: 87-91. 3-Warren N C J, Portillo C, Dawson-Rose and Stringari-Murray S. "HIV Primary Care Curriculum Improves HIV Knowledge, Confidence and Attitudes." TheJournal for Nurse Practitioners, Available online,10 May 2018. 4-BehmaneshM, TaheryK, Hoseiny S M, BromandZ. Relationship between quality of life and social support in women with HIV / AIDS. Journal of Qazvin University of Medical Sciences, 2012, 3(86): 41-47. 5-King B. and Winchester M S. "HIV as social and ecological experience." Social Science & Medicine,2018,208: 64-71. 6-Zarabadypoor M, Borhanmajaby K, Bagherzade S, Mozafary F. A surveyon the knowledge and attitude of patients referring to the Qazvin dental faculty about AIDS, Journal of Qazvin University of Medical Sciences. 2018, 22 (1), 96: 87-91. 7- Ren JM, Zhao B, Liu Q, Wu and Zheng T. "Factors Associated with Sleep Quality in HIV." Journal of the Association of Nurses in AIDS CareAvailable online,2018, 23 April 2018. 8-Brandt CP DJ, PaulusC, Jardin L, Heggeness and Zvolensky M J. "Examining anxiety sensitivity as an explanatory construct underlying HIV-related stigma: Relations to anxious arousal, social anxiety, and HIV symptoms among persons living with HIV." Journal of Anxiety Disorders, 2017,.48: 95-101. 9-Gokengin D C, Oprea J,Begovac A. Horban and O. Yurin (2018). "HIV care in Central and Eastern Europe: How close are we to the target?" International Journal of Infectious Diseases, 70: 121-130. 10-Rahbarian M, Hoseinzadeh R, Dosty P. The Effect of Effective Communication Training on Narcotic Drugs Based on Cognitive-Behavioral Model on Communication Patterns and Relapse. 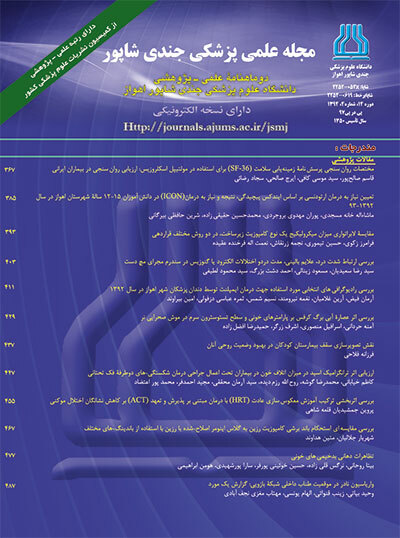 Journal of Qazvin University of Medical Sciences. Qazvin University of Medical Sciences, 2016, 5 (88): 44-51. 11-Kabat-Zinn J. An outpatient program in behavioral medicine for chronic pain patients based on the practice of mindfulness meditation: theoretical considerations and preliminary results. GenHosp psychiatry. 1982; 4: 33-47. 12-Masumian S, Shairi MR, Hashemi M. The effect of mindfulnessbased stress reduction on quality of life of the patients with chronic low back pain. Anesthesiol Pain. 2013; 4: 25-37. 13-Feldman G, Dunn E, Stemke C, Bell K, Greeson J. Mindfulness and rumination as predictors of persistence with a distress tolerance task. Person Indiv Diff.2014; 56: 154-8. 14-Kabat-Zinn J. Full catastrophe living: Using the wisdom of your body and mind to face stress, pain and illness. 5th ed. New York: Dell Publishing; 2005: 121-45. 15-Kuhlmann J M, Keaei R, Conde S M A A Evers and Hiligsmann M. "A Cost-of-Illness Study of Patients with HIV/AIDS in Bogotá, Colombia." Value in Health Regional Issues, 2017, 14: 103-107. 16- Kumar SJ, Tadakamadla A Y B HAreeshi and TobaigyH A W M. "Knowledge and attitudes towards HIV/AIDS among dental students of Jazan University, Kingdom Saudi Arabia." The Saudi Dental Journal, 2018, 30(1): 47-52. 17-Betancur M N L, Lins I R D, Oliveira and Brites C. "Quality of life, anxiety and depression in patients with HIV/AIDS who present poor adherence to antiretroviral therapy: a cross-sectional study in Salvador, Brazil." The Brazilian Journal of Infectious Diseases. 2017, 21(5): 507-514. 18-Suyanti T S, KeliatB A ,Daulima N H C. "Effect of logo-therapy, acceptance, commitment therapy, family psychoeducation on self-stigma, and depression on housewives living with HIV/AIDS." EnfermeríaClínica, 201828(1): 98-101. 19-Shadloo B M, Amin-Esmaeili A,Motevalian M,Mohraz and Rahimi-Movaghar A. "Psychiatric disorders among people living with HIV/AIDS in IRAN: Prevalence, severity, service utilization and unmet mental health needs." Journal of Psychosomatic Research, 2018, 110: 24-31. 20-HaileK T A, Ayele A B. Mekuria C A. Demeke and ErkuD A. "Traditional herbal medicine use among people living with HIV/AIDS in Gondar, Ethiopia: Do their health care providers know?" Complementary Therapies in Medicine, 2017, 35: 14-19. 21-Adelekan M. "A critical review of the effectiveness of educational interventions applied in HIV/AIDS prevention." Patient Education and Counseling, 2017, 100(1): 11-16. 22 -Santos K D, Azevedo A P K. Silveira J C, Leitão and Knackfuss M I. "Physical activity and sleep of persons living with HIV/AIDS: A systematic review." Value in Health Regional Issues, 2017, 10(1): 19-24. 23-Giménez-García C, Ruiz-Palomino E, Gil-Llario M, Ballester-Arnal R, Castañeiras C, García G. Why Do Young Hispanic Women Take Sexual Risks? Psychological and Cultural Factors for HIV Prevention, 2018, 29, 5: 762-769.